Landfills have been around for a long time – perhaps even longer than civilization. Archaeologists often study middens (a fancy way of saying “old trash piles”) to discover information about how ancient people lived, what they ate, and what they produced. Someday, archaeologists may dig up our landfills to learn more about our culture. So, what would they find? The contents of modern refuse piles are very different from pre-industrial middens. We throw away our trash wrapped in plastic bags, and we abandon all kinds of exotic things. Modern trash includes heavy metals, broken glass, and chemical waste. To contain these toxic materials, many countries now require landfills to be lined and Environmental Protection Agencies monitor ground water near landfills. Photo courtesy of maol at Flickr.com. Trash is brought in by the truckload, sorted by automatic machines to remove recyclables, and then compacted. The compacted trash is “juiced” to remove liquid, and then piled into trenches. At the end of each day, layers of dirt are piled on top of the newly deposited trash. Topping landfills with layers of dirt controls the smell of decaying diapers, kitchen scraps, and yard trimmings while also keeping birds and other animals from foraging. This process creates a layer cake of trash and dirt, with remaining liquids sinking to the bottom of the landfill. Rainwater also trickles through the trash heap, further eroding soluble trash. At the bottom of the landfill, waste pipes gather the liquid that leaches through the pile, and it’s drained away for treatment. Landfills act like giant contaminated compost piles. Over time, the organic matter in landfills will slowly break down into more stable compounds. This composting process takes an average of 30 years from the time that the last dump trucks deposit waste into a landfill. That’s much, much longer than the time it takes compost to break down into soil in a well-run compost pile. It can take as little as 3 weeks for an efficient composter to complete the job! As anaerobic bacteria digest our trash, they release Carbon Dioxide and Methane gas, both of which seep out of the soil and into the air. 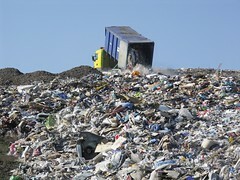 Worldwide, landfills are one of the largest producers of methane. This gas can be a major problem – it causes throat irritation, absorbs infrared radiation 21 times as effectively as carbon dioxide, and it also causes global warming through other methods (such as retaining water vapor in the upper atmosphere). Pound for pound, methane emissions are outnumbered by Carbon Dioxide emissions, but due to its greater impact, methane causes more intense climate change. CH4 concentrations have more than doubled over the last 150 years, and the contribution to the enhanced greenhouse effect is almost half of that due to CO2 increases over the same period. …the greenhouse burns the gas generating 5.55 MW of electricity for sale to B.C. Hydro and 100,000 GJ/year of heat for sale to CanAgro. The project results in the recovery of approximately 500,000 GJ/year of energy, the total energy requirements of 3,000 to 4,000 homes, and results in a reduction of more than 230,000 tonnes per year CO2 equivalents or the emissions of approximately 45,000 automobiles. The City of Vancouver will receive revenues of approximately $400,000 per year for the duration of the 20- year contract period. Burning methane gas to create power is a double win for the environment. Not only does this electricity displace other dirty power sources (50% of power in the US comes from coal power plants) – it also denatures methane and reduces its climate change impact. Burning methane converts it into Carbon Dioxide and water vapor – both of which have less impact on the environment than methane. How does your local landfill process methane gas? Do you even know where your trash goes? Contact your town hall, and find out. Ignoring where trash goes can have a huge cost on our environment and health. In addition to generating electricity, landfills can serve additional purposes after they fill up. For centuries, waste material has been used to “reclaim” real estate along the shore. For example, the Dakin Building in San Francisco was built out on the bay after construction waste was used to extend the shoreline. Research is also underway to harvest recyclable materials and fertilizer from landfills. How much landfill space is left? This is a tricky question, because new landfills are constantly opening as old ones fill up. Also, natural decomposition can cause landfills to collapse as much as 2 feet per year. At the turn of the twentieth century, some states were almost completely out of usable space. New York was infamous for trying to export it’s garbage – you may remember the famous Islip Garbage Barge that sailed nearly 6,000 miles without finding a site willing to accept it’s payload. Now, the situation has changed and there’s plenty of available landfill space in most areas. New York has an estimated 12 years of capacity (if no new facilities are opened). Other states have varying amounts of landfill capacity; for example Illinois has enough landfill capacity for about 41 years. In the 1970s, there were more than 20,000 landfills in the United States. There are far fewer today, numbering 1,654, but they are more centrally located and larger than previous sites. While there’s no immediate shortage, the fact that we’re constantly opening new landfills is worrying. After all, would you like a landfill “centrally located” near your back yard? In order to avoid landfill sprawl, intensive composting and recycling are the best options.